If you think you have DCI please call MDC immediately. Please note, that due to the nature and unpredictability of nitrogen bubbles in the body tissues, contact should be made as soon as possible. If you delay, your condition can worsen. Do not assume that because your dive was shallow or that you followed the dive profile exactly that you cannot have DCI. Symptoms requiring treatment have occurred from as little as 6.5 metres! For all non-urgent medical enquiries, you can complete the contact form to have your questions emailed to MDC. 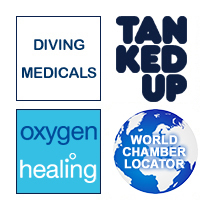 If you require general dive related medical advice, fill out our MDC Medical Advice form. It's Free! For DCI cases - when travelling south along Barby road, take the first left into the hospital grounds (onto North Road) until you come to Redwood House on the right hand side: this is where the chamber is located. For dive medicals - due to limited parking space directly outside the chamber, non-emergency cases should proceed to the large pay and display car park at the front of the hospital and enquire at the main reception of the hospital for directions to the chamber. This satellite map of the hospital location might help get you here and this internal map of the hospital should help with the final approach. Can't locate the information that you are looking for? Try the Midlands Diving Chamber Site Map. For queries specific to London and the south-eastern area, please contact the London Diving Chamber.